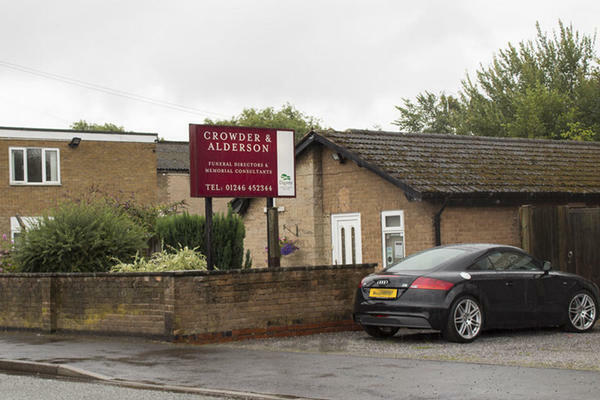 We, Crowder & Alderson Funeral Directors, have been serving the families of Chesterfield since mid 19th century. At first as Alderson Funeral Service, then as Crowder & Alderson when Graham Crowder joined us in 1963. Through all the changes, we have stayed true to the principles set by our founder, Henry Alderson; compassion, respect, high quality of service and total commitment to the families in our care. You and your family are our top priority. What matters to you, matters to us. Let us help ease your concerns when it comes to arranging a meaningful and personal farewell for your loved one. We will look after all the arrangements, so that you can focus on looking after yourself and your family. How you want to say goodbye to your loved one is completely your choice. Just let us know what your preferences are, whether that is a cremation, a religious funeral, a contemporary service or a bespoke ceremony, and of any personal touches you want to include, this could be a special song, poem, hymn, flowers or donations. Nothing is too much trouble. If you cannot come in to see us, don’t worry, we will come to see you in the comfort of your home. We have two individual chapels of rest, should you wish to spend time with your loved one before the day of the funeral. If you wish to visit outside of normal hours, let us know and we will happily open our funeral home for you. You are not alone. We are here to help you, day or night. Just give us a call. We will be honoured to help you in your time of need. Call us today on 01246 452344 to talk through your personal requirements. At Crowder & Alderson Funeral Directors, we understand how special life is with those that you love. For us, every funeral is unique and personal. We have a service to fulfil every wish, with every detail carried out with the same uncompromising quality of care. From a traditional service, to a colourful woodland burial, your options are limitless with our Full Service Funeral. If you have a little more flexibility when it comes to arrangements, then we can provide a Simple Funeral for a lower cost. The is off road parking available at our funeral home and on road parking on the surrounding streets. We are located in the commercial estate behind the main landrover garage off the main road at the bottom of the hill, next door to JBS tuning garage and saferail windows. Our staff are available 24 hours a day on 01246 452344 if you require our services outside of these hours. From our first contact all the staff were professional at all times, they helped us through a very difficult time in a compassionate and caring way. Thank you for your online review. I am glad that we were able to provide you with the care and support needed and that we were able to help make things easier for you at such a difficult time.